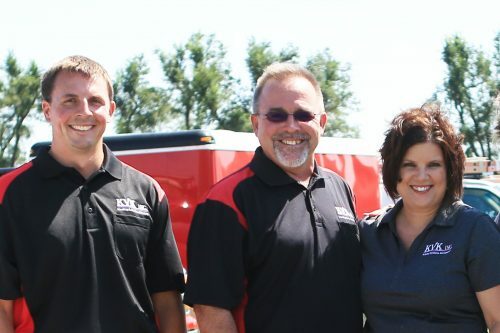 Locally-owned and family-operated since 1996, there’s no better HVAC service in Central Kansas than KVK Inc.! Our team of highly skilled and knowledgeable technicians specialize in air conditioning and heating system installations, repairs and maintenance, no matter the scope or depth of the job. Call us today for service throughout the surrounding Tri-County area and Central Kansas. The forced air in your home—your heating and air conditioning in Central Kansas—is central to your quality of life. Being able to adjust your thermostat and get perfectly cooled air in the summer and warm air in the winter is critical to enjoying your home life and essential in staying comfortable and safe. This system requires ongoing maintenance and service, however, which means keeping up with their function before breakdowns, inefficiencies or other such problems arise. For the best HVAC service in Central Kansas—whether for routine maintenance or an emergency issue—make sure KVK Inc. is the only call you’re making. We’re the leaders for all things heating and cooling, prepared to help you achieve the very best forced air quality in your home! We’re a certified York Dealer, however we have the expertise to work on any and all manufacturer brands and models! Call us for service wherever you are in Central Kansas! We’re pleased to serve Dickinson, Marion, Morris Counties and more. All of our technicians are trained and certified to provide a wide gamut of services. We’re truly your heating and cooling experts! Our company is fully licensed, bonded and insured for your peace of mind and protection. We offer a Discount Club Membership Maintenance Plan! Call for pricing and to learn more about the many benefits it will afford you!